In my spare time, you will invariably find me tinkering on some mechanical device at my friend Tim's shop in rural Kansas. He is a gifted mechanic and has a bewildering array of tools at his disposal. Most of the time, whether I am fiddling with my supercharged Ford or some old military air compressor, common hand tools will suffice. Once in a while though, I run into a situation where a specialized tool is required. A relatively easy job will suddenly grind to a halt due to not being able to reach or remove a certain part. When such a situation stonewalls me, I'll call my friend over. Tim will peer at it for a moment and then walk off in silence to root around in his shop. A minute later, he will reappear and hand me a specialized tool just for that specific task. A job that had suddenly become extremely difficult suddenly becomes quite simple, just by having the right tool for the job. Why am I talking about tools? Well, SIG Sauer's Rattler is in reality a highly specialized tool, developed to solve a specific problem, for people who do a special type of work. Once you delve into it, you quickly figure out the Rattler is a very well thought out piece for its intended mission. I'm not going to go into "who" the Rattler was originally designed for, that's unimportant. Instead, let's take a look at "what" makes SIG's new "Shortie" so interesting. In a nutshell, SIG Sauer's Rattler SBR and PSB pistol both put rifle performance into a submachine gun size package. The Rattler is not just small; it is ultra-compact for its caliber. The Rattler SBR, at just 16 inches, is almost as short as a 9x19mm MP5K PDW. Unlike the MP5K PDW though, the Rattler is chambered for 300 AAC Blackout and 5.56x45mm NATO. The 300 Blackout model, seen here, offers a dramatic step up in performance and reach, compared to any pistol-caliber system. So, what exactly is the intended function of SIG Sauer's new Rattler? Unlike older Personal Defense Weapons, such as FNH's P90 and HK's MP7, the Rattler was not specifically designed to replace a service pistol in a traditional roll. The P90 and MP7 both have their roots in the 1990 NATO Doc D296, which was intended to lead to the replacement of 9x19mm NATO firearms. The goal was to develop a compact weapon system that was easier for moderately trained soldiers to shoot than a conventional service pistol, while being capable of defeating Soviet body armor. It was intended to be issued to support troops such as truck drivers, armored vehicle crewmen and others who did not need a rifle. The Rattler, on the other hand, was designed to be extremely compact to allow discreet carry. Rather than replacing it, the Rattler is intended to supplement a handgun. What it does is allow a very compact rifle-caliber long arm to be carried discreetly, when the only other option would be a handgun or compact submachine gun. It is intended for those times when a rifle-caliber long gun is required, but even a compact 10.5-inch or 8.8-inch carbine is simply too big. By chambering the Rattler for 300 AAC Blackout, SIG Sauer was able to take advantage of this cartridge's particular capabilities. Rather than firing lightweight small-caliber projectiles like both the P90 (5.7x28mm) and MP7 (4.6x33mm), the Rattler is able to fire both moderate-weight supersonic and heavy subsonic .30 caliber projectiles. With supersonic ammunition, the Rattler has superior terminal performance, exterior ballistics, range and penetration of intermediate barriers compared to the 9x19mm NATO, 5.7x28mm and 4.6x33mm. Due to the ultra-short 5.5-inch barrel, the 300 Blackout also offers an advantage over conventional 5.56x45mm ammunition. The report is not as sharp, and it has less blast and flash. Terminal performance with modern expanding loads is also superior. Plus, if required, subsonic ammunition can also be fired. It is also easily suppressed without the problems encountered with ultra-short barreled 5.56x45mm systems. Even with the very short 5.5-inch barrel, a 300 BLK suppressor will live a relatively long life compared to one mounted onto a similar-sized 5.56x45mm. While ideal engagement distances are within 100 meters, the Rattler/300 BLK combination is capable of reaching further. It is a much more capable system at distance than, say, a 9x19mm MP5K PDW. It hits with authority at 200 meters and can reach out past 300 meters, although this is not what it's intended for. Supersonic ammunition easily penetrates Level IIIA soft body armor. It must be understood, the Rattler was designed for a specific purpose. It is not a replacement for a 10.5-inch 5.56x45mm carbine. Rather, it is a specialized tool for certain situations that require a low profile, unarmed appearance and a hard-hitting long gun capable of being carried very inconspicuously. Let's take a look at what SIG Sauer came up with as a solution to this discreet carry question. The Rattler is a member of the MCX Virtus family of gas piston-operated firearms. It is available in two configurations, the Rattler SBR, which is a Short Barrel Rifle, and the Rattler TPB, which is a pistol fitted with a telescoping pistol brace. It is currently offered in two calibers: 300 AAC Blackout and 5.56x45mm NATO. Other than one legally being a rifle and the other a pistol, the only differences I know of between the two models is what is bolted to the rear of the receivers. So, if you buy a pistol and register it as an SBR, after you get your stamp back from the BATFE, you can easily swap the shoulder brace for the side-folding stock. The MCX lower receiver is similar to an AR-15 lower receiver and is machined from aluminum. The most obvious difference is the lack of a receiver extension. Instead, the rear of the receiver features a short 1913 rail for mounting the stock of your choice. SIG Sauer offers a number of stocks to choose from for the MCX series, and all will bolt up to the Rattler family. The PSB pistol seen here comes with a three-position collapsing arm brace. When fully extended, the rear of the brace is 12 inches from the trigger. 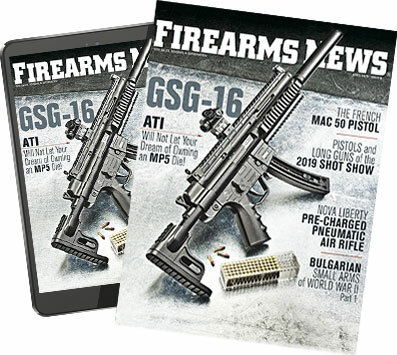 The lower accepts standard STANAG pattern magazines, so there is no need to purchase expensive proprietary magazines. The controls are laid out exactly like an AR-15, so there is no need to learn a new manual of arms. If you can run an AR, you can run a Rattler. On the left-hand side of the receiver, you'll find an extended bolt release, ambidextrous magazine release and safety. On the right side of the receiver is a short ambi-safety and magazine release. So the design is made to be run from either shoulder. An enlarged trigger guard allows easy operation with gloves. SIG Sauer's enhanced trigger is included, along with a Magpul MOE-K pistolgrip. The upper receiver is where the magic happens. Unlike the lower receiver, the upper is specific to the Rattler series. The upper is machined from aluminum and features a full-length MIL STD 1913 rail for mounting optics, BUIS and accessories. A spring-loaded dust cover is fitted to the ejection port, and a case deflector is standard, but not a forward assist. An ambidextrous AR-type charging handle is fitted, so again, there is no learning curve to operate it. A replaceable metal insert in the receiver prevents wear from the cam pin. This lengthens the life of the upper receiver. A short aluminum handguard features Magpul M-LOK slots for mounting accessories. This piece is easily removed, so if SIG Sauer offers other types of handguards down the road, it can easily be swapped without tools. Sling attachment points are provided on the left and right sides of the handguard, receiver and the SBR's side-folding stock. The Rattler utilizes the MCX's short-stroke gas piston operating system, in an abbreviated fashion. The design utilizes a rear take-down pin and front pivot pin, just like an AR. So, take-down is very simple. The bolt carrier and recoil spring assembly remove as one unit, similar to an AR bolt carrier. In hand, the bolt carrier assembly looks familiar enough for anyone familiar with an AR to figure out. The carrier is shorter than an AR's and features dual-captured recoil springs on top, but the general layout is the same. By pushing through one cross pin, the piece that locks the recoil spring to the bolt carrier assembly can be removed. The recoil spring assembly is then slid off the bolt carrier assembly side-ways to the left. With this removed, the bolt carrier is only 3.5 inches in length. To take this down, push through the firing pin retainer to the left. Unlike an AR, this will stay in the carrier to prevent loss. With this slid out of the way, the spring-loaded firing pin can be removed straight to the rear. The cam pin can now be removed, just like an AR, and the bolt can then be pulled from the front of the carrier. Of interest is the Rattler's bolt. This features a plunger ejector and spring-loaded extractor. Unlike a standard AR, the Rattler's rotating bolt features rounded lugs to prevent fractures and increase durability. Actually, the whole system has been designed to provide a very long service life before any parts need to be replaced. SIG Sauer claims 20,000 rounds before any parts replacement. This is dramatically longer than an M4 carbine. With the upper removed from the lower receiver, and the handguard removed, you have full access to the barrel assembly. A cold-hammer-forged barrel with a fast 1 turn in 5-inch twist rate is standard. The super-fast twist is required to obtain best accuracy with both light supersonic and very long subsonic projectiles. The barrel is fitted with an AR-style extension and locked into the receiver by two transverse bolts. I measured the barrel shank at 1 inch. This tapers down to approximately 0.875", and then to approximately 0.75" in front of the gas block. Just before the muzzle threads, the barrel features an indexing cone for aligning a SIG Sauer sound suppressor. A beefy gas block is secured to the barrel using two cross-pins. At the front of this is a two-position gas regulator, which provides for suppressed and unsuppressed firing. To adjust, depress a spring-loaded detent and rotate it to the right side of the rifle for unsuppressed fire, and to the left for suppressed. To remove for cleaning, rotate approximately 180 degrees and pull straight out the front. The gas piston can then be tapped out with a cleaning rod. The gas piston features a much-abbreviated tappet, approximately 3/16" in length. Stripping, cleaning and reassembling the Rattler is straightforward, with only a cartridge required. Add a length of cleaning rod if you want to pop the gas piston out. Yes, it does have more bits than an AR, but it's by no means complicated. Initial testing was conducted using SIG Sauer's 300 BLK 125-grain Match load. I mounted a SIG Sauer Romeo3 red-dot sight and hit the range. Initial testing was conducted mostly at 50 yards to check reliability and to get a feel for the Rattler. My friend and colleague, Neal Shera, who happens to be a South Paw, and I took turns firing the Rattler, an MP5K PDW clone, and a 7.5-inch barreled AR-15-type rifle with side-folding stock in 7.62x39mm. We ran some basic drills, engaging multiple steel silhouettes with single and multiple rounds to check the Rattler's handling, controls, recoil impulse, noise and blast signature. Some drills were started with the brace fully collapsed, so we had to first quickly extend it before engaging a target. From here, I moved to formal accuracy and velocity testing conducted from a rest at 100 yards, using a Burris 5x scope. Accuracy was checked firing four, five-shot groups using seven supersonic and three subsonic loads ranging in weight from 110 to 220 grains. Velocity was measured using a LabRadar Doppler radar chronograph. I was very interested to see what type of groups it printed and just how much velocity was lost with the 5.5-inch barrel. Accuracy was excellent with certain supersonic loads. Best accuracy was obtained using Black Hills Ammunition's 125-grain OTM load, which posted a best of 1.3 inches and averaged an impressive 1.5 inches. This load also posted the highest velocity, averaging 1,910 fps. Hornady's 110-grain VMAX load also shot very well, averaging 1.8 inches at 1,878 fps. Keeping in mind this is a 5.5-inch pistol, I felt accuracy was quite acceptable. My one negative comment regarding time spent on the bench, shared by all who shot it, concerns the trigger. It's heavy. A piece in this price range deserves a better trigger. From here, we moved to shooting from field positions using Black Hills' 125-grain OTM load. Neal started sitting and shooting from 200 yards on a full-size silhouette, while I spotted. He had no problems making hits at this distance, so we moved to 300 yards. Despite the wind gusting between 12 and 15 mph, he was able to make consistent hits on an 11x20 inch LaRue reduced-sized silhouette target. Using his wind call, I tried my hand shooting prone at 300 yards and scored a hit with my first shot. I made a few more hits, and then decided to see just what the Rattler was capable of doing. Moving to 500 yards, I guessed the elevation and windage and fired a round off. It impacted a couple inches above the LaRue. Refining my hold, I was able to score a few hits, with my misses just off the steel. We finished off testing with a night fire, to check the flash signature in total darkness. An observer stood 90 degrees from the muzzle, while both SIG Sauer supersonic and subsonic ammunition were fired. Muzzle flash was not visible behind the gun. To the side, a small flash was visible, extending approximately one to two inches in front of the flash suppressor. The flash signature was relatively small and muted. Blast and flash signature are dramatically less than off my 7.5-inch 7.62x39mm AR. All in all, SIG Sauer's new Rattler PSB is an impressive piece. Reliability was flawless using seven supersonic loads ranging in weight from 110 to 150 grains. Practical accuracy is excellent. I did not test the subsonic loads with a sound suppressor attached, as the piece is designed. The 220-grain loads cycled without issue, but the 208-grain Hornady load failed to cycle properly. Simply mounting a suppressor should cure this. I found the Rattler smooth shooting, easy to control and very quick handling. To extend the brace to the first position just depress the button and pull. To fully extend it, depress the button and give it a firm yank and it will not lock into the first position. The controls are well placed, easy to manipulate and the piece is South Paw friendly. The trigger weight is heavier than desired though. Even so, if you do your part the Rattler will make hits on a man-sized target past its practical useful range. Size-wise, the Rattler is very compact at 19.3 inches with the brace collapsed, and 23.5 inches with it fully extended. However, the brace does add a few inches in overall length, compared to the SBR's side-folding stock. I would much prefer a side-folding arm brace. This would shave a few inches off and make for more compact storage. Even so, it stores easily in a messenger bag and can be fired with the brace fully collapsed. It's very fast to put into action. At just 5.1 pounds, it is also very light. SIG Sauer's Rattler is an excellent choice for its intended purpose: discreet carry in an unobtrusive bag. It's not a replacement for a carbine, and the short barrel does cost velocity. Proper load selection is critical. Its performance, though, easily trumps something like an MP5K PDW. Unfortunately, the price of admission is very high, with an MSRP of $2,719 for the pistol, and $2,727 for the SBR. This will definitely place it out of reach of most. If you have the need and the coin though, I recommend taking a hard look at it.